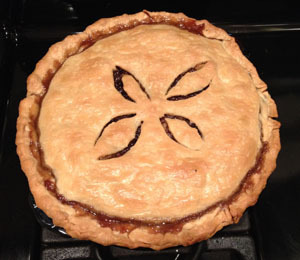 A recent project tied to food (the History Colorado Center exhibit, Food: Our Global Kitchen, opening Memorial Day) inspired my colleague, Leigh Jeremias, and I to try making a traditional fruit pie. Researching cookbooks in our collection, we encountered this fruit pie again and again. As we started asking friends and family about it, a certain age group always spoke of this fruit pie with fondness and nostalgia. Believe it or not, the fruit pie I’m referring to is known as mincemeat or mock mincemeat pie. But don’t let the name scare you, because the end of this curious adventure turns out well. Mix ingredients together and cook over medium heat, stirring occasionally, about 20 minutes (really cook until the apples are as firm or soft as you like them). Pour mixture into the prepared pie crust. Top with the second crust. Pinch and crimp edges to seal. Pierce the top in several places with a fork. Bake in preheated oven for 15 minutes. Reduce oven temperature to 350 degrees and bake until top is golden brown (at this point I brushed the top with butter to add to the flavor and to brown the top) about 30 minutes more. Cool before serving (or not, you could serve it warm with ice cream). Now, I must admit that the original recipe only listed ingredients with limited measurement details. For this reason, I decided to look at other mincemeat recipes and based on my research I came up with the modified recipe above. So…are you willing to give a curious fruit pie a try? As my colleague, Alisa Zahller, said, I am a bit more curious when it comes to food. I wasn’t going to let the name “mincemeat” scare me away from trying this traditional recipe. Nor was I going to find a substitute for one of the main ingredients, suet. What is suet? It’s the hard fat around the kidneys and loins in beef and mutton. Just ask your local butcher for a little and chop it real fine. Like Alisa’s recipe, this recipe was from the Gem Chopper cookbook and has limited details. I also cut the recipe in half. Mix ingredients together and bring to a boil. Boil hard for about 15 minutes. Pour mixture into the prepared pie crust. Top with the second crust. Pinch and crimp edges to seal the crusts. 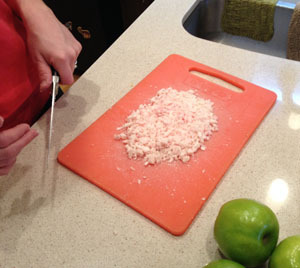 Pierce the top crust in several places with a fork. Bake in a 350 degree oven for about 45 minutes and until top is golden brown. Let stand for about 15 minutes before serving. My crust has never looked better. I think it was from the suet, whichbaked-mince-meat melts once the mixture comes to a boil. I served it to my family first and the reviews were all good; even my kiddos enjoyed it. It is a very sweet meat pie. I served it to a few brave souls at work who all enjoyed it except for one (it was a texture thing for her). Most were not put off by the meat. All and all, I liked both pies and would make both again. 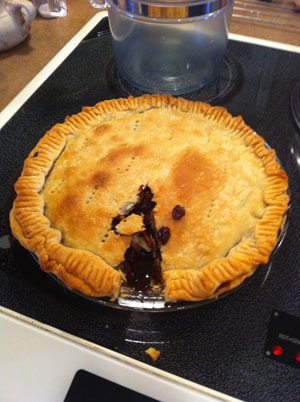 Many traditional mincemeat pie recipes include brandy. Maybe I’ll try that next time.